Content coming soon. Contact us with your specific needs and we'll show you how we can help! Whew, that is a lot of hard work! Now you can sit back and enjoy your beautiful backyard pool. 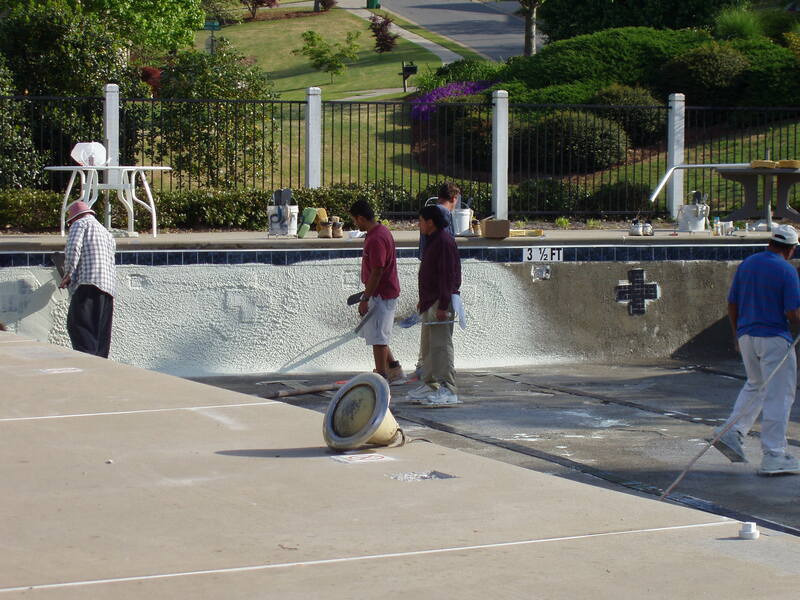 Thank you for considering Splash Pool Management Co. for your replastering and renovation needs. I am confident that my attention to detail, drive for perfection, and organizational skills will give you a high quality renovation project. The prep and bond coat is the most important step in the replastering process. This application ensures proper adhesion of new to old plaster. Our prepping process includes mechanically checking every square foot of pool floor surface for hollow spots. We chip out and remove these areas. The entire surface is then acid washed and neutralized to remove all oils and debris. Our acrylic bond coat is applied evenly and thoroughly for 99% coverage. An equally important step is the under water curing of the plaster finish which will occur over the next 10 to 12 months. During this time the plaster is very susceptible to poor water conditions. This underwater curing process causes an unbalance in the water chemistry as the pool actually grows calcium hydroxide, calcium carbonates, and calcium silicates which strengthens and seals the porous surface of the new finish. At least 60% of the maturing process is accomplished within the first 28 days. It is imperative that the water chemistry and the care of the plaster be maintained during this period to help ensure a long lasting and high quality plaster finish. We include this service and the chemicals necessary to ensure proper curing and to balance the water. Please contact us for a detailed list of our replastering procedure. Are you a new swimming pool owner or want to learn how to safely operate your pool? Let one of our Certified Technicians give you a guided tour identifying your pool structure and explaining each piece of equipment. This is your opportunity to ask any and all questions about your pool. We will properly train you on how to maintain the unique aspects of your swimming pool and teach you how to identify problems. In many cases early identification of problems can save a pool owner money, time, and aggravation. Our Pool School will help you decide whether you would need our regular residential service or to enjoy taking care your beautiful backyard pool yourself. 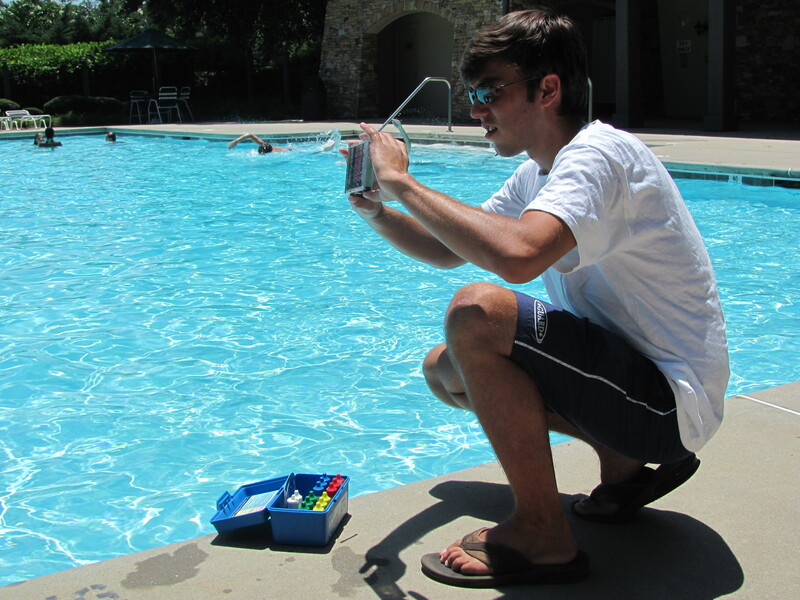 Splash Pool School takes place in the comfort of your own back yard and usually takes about 1 ½ to 2 hours. We highly encourage you to take many notes and even video if you wish. Ready to go to Splash Pool School? Contact us today. After the initial pool build, the pool plaster is the most expensive element and investment of the pool. If properly maintained, the pool plaster should last 5-10 years or longer. During the summer months the plaster and pool water is well cared for. However, in the off season the pool and water is often neglected for 7-8 months of the year. Failure to keep the water balanced on a regular basis can result in staining, pitting, or scaling, decreasing the appearance and life of the plaster and is expensive to correct. In addition to the pool, the area inside the pool fence is often neglected as most landscaping companies are not contracted to attend to this area. This unsightly collection of leaves and debris on the deck and pool area are not only a hindrance to the appearance of the property but also increases rodent and insect issues. In addition, the bathrooms are often left in an unsanitary condition for months on end. We appreciate your interest in this program. This service is designed to minimize algae growth, maintain chemical balance and reduce additional spring start-up costs and enhance the appearance of the pool area for an additional 7-8 months of the year. As pool professionals, we urge you to protect your investment and participate with this winter maintenance program. Please feel free to contact us with any questions. Use the Taylor test kit, refer to the directions on the inside of the lid. Rinse comparator tube 3 times in the pool. Take water sample from elbow length deep. Measure water in the comparator tube at the bottom of the meniscus. Hold reagent bottle vertically to squeeze a drop. Dump the tested water into trash. Do not dump the tested water back into the pool. Rinse comparator tube 3 times and store upside down in the test kit. We want to provide exceptional pool management and service to the Cobb, Paulding, and Bartow County areas. By staying local and exclusive, we can strenuously maintain our high standards and attention to detail that has set us apart from the rest for more than 15 years. © 2018 Splash Pool Management. All Rights Reserved.